Windows 10 comes up with lots of keyboard shortcuts that save the users time by not going through multiple mouse clicks. There are many users who are not aware of these shortcut keys. 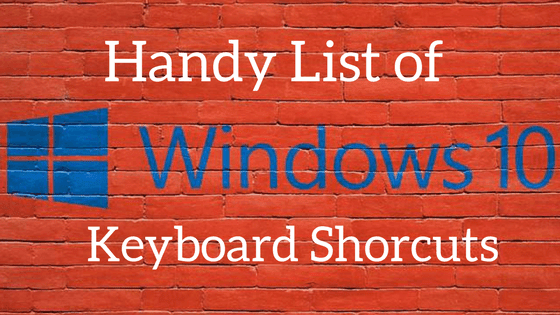 However, there’s no need to know about all the shortcut keys but knowing about the ones that are useful to you can enhance your Windows 10 experience. In this article, you will learn about all the important Keyboard Shortcuts in Windows 10 that you should know about. Windows Key + Q – Opens Cortana Search by keyboard and voice. Windows key + PrtScn – Takes the screenshot of the screen and saves it automatically. PrtScn or Ctrl + PrtScn – Takes the screenshot of the whole screen and save it to the clipboard. Alt + PrtScn – Take screenshot of the active window. Windows + Shift + S – Takes screenshot of the selected region. Note: If you want to learn how to take a screenshot using snipping tool or Third-party software like PicPick, read this article on Windows screenshot tutorial. If you are aware of any other keyboard shortcuts, please mention them in the comments below.